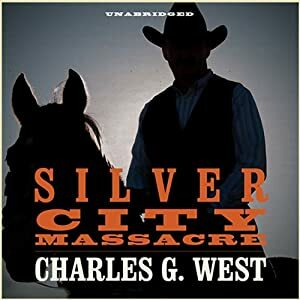 This is a fine, entertaining, western listening experience. Joel McAllister is a lieutenant in the Confederate Army – or at least he was, until Lee surrendered. Now he's determined to get as far away from war as possible, somewhere beyond North and South…and maybe somewhere with some gold: Idaho Territory. Accompanied by his steadfast sergeant, Riley, the two former soldiers travel westward from Texas. But the trail to Silver City is littered with peril - including a band of notoriously merciless Comanche warriors. When his traveling party expands to include two women survivors of a Comanche raid and a Bannock Indian, Joel will need to rely on what soldier's instinct he has left in him to deliver everyone to Silver City alive - and keep them alive once they're there. ©2014 Charles G. West (P)2013 Blackstone Audio, Inc. I enjoyed listening to this western that reminded me of the older, classic western movies my husband watches. I think he would like this in movie form and would probably enjoy listening too. Joel McAllister leaves his former Confederate army troop to head north to Idaho where he hopes to meet up with his brother in Silver City. His brother had been injured in the war and went off to settle on land, with a small mine, outside of Silver City. Joel hasn’t heard from him in a long time but he has no where else to go. Joel is joined by a rough Sergeant Riley who has fought with him and they respect and trust each other. Although they are both good men, they push the boundaries where they feel it is justified in their best interest, which includes helping themselves to a couple of horses and some supplies to help the journey. Riley has some helpful knowledge on the direction and landmarks they need to follow as they head north. But the men must be careful to stay alert as the way is treacherous with the possibility of hostile Indians anywhere along the way. At one point they come upon an Indian attack on a small group of wagons. They arrive too late to help in the main fight but in time to save a woman and young girl. The strong headed woman is clearly used to being independent and able to fend for herself. When Joel would drop them off at a settlement along the way she insists that they will continue with Joel and Riley until they reach Silver City. They band pick up another traveler when they pass some Indians and one tries to steal a horse. Joel makes a deal with Red Shirt to guide them through the territory in exchange for a horse. Red Shirt too insists on staying when they reach Silver City. Joel and his group finally arrive to find his brother struggling to protect his cattle, the mine and his home. There is large landowner nearby who wants the McAllister land and although the man holds himself out as a trustworthy business man in town he has actually hired gunslingers to intimidate or, if need be, kill the neighbors to get the land holdings. Joel has survived the long trek home but can he protect his friends and survive the attacks by the local land baron? This is a well written story with plenty of action as well as interesting characters. If you enjoy tales of the old west this is a great selection. Audio Notes: Jim Meskimen’s voice is a good match for the story. He is not gruff but strong enough to make it a very easy listen with clear story presentation. I wouldn’t necessarily read this type of book but I enjoyed it as a good audio choice.